This become so much easier for SCCM engineers to restart the device with just one click . To identify devices that are pending a restart, you can go to the Assets and Compliance workspace and select the Devices node ,then right click on the right side details pane in a new column named Pending Restart. Once you choose this, you can sort with pending restart to see list of all devices with client state . To restart the device ,you can simply right Right-click on the device, select Client Notification, and then select Restart. An information window opens about the restart. Click OK to confirm the restart request. When the notification is received by a client, a Software Center notification window opens to inform the user about the restart. By default, the restart occurs after 90 minutes. You can modify the restart time by configuring client settings. Settings for the restart behaviour are found on the Computer restart tab of the default settings. If you want to know the list of pending reboot devices ,it is not always good to follow the steps that we did above .It doesn't give us the number of devices pending with reboot also ,you need to add the column and sort to find out how many. In this blog post ,what we will see on how to create a dynamic collection that list all devices with pending reboot. This collection always be on your check list for troubleshooting. Also ,i will get you nice SSRS report/s that show you the count of pending reboot devices against the collection Operating System and then it will have drilldown report to see list of all clients with client inventory. Before we start creating collection with pending reboot ,we need to know ,where does this information store in WMI. Collection uses WQL hence you need to have the class and instance name. Restart information stored in sms_combineddeviceresources with value clientstate. Anything that is not 0 (clientstate!=0) will be treated as pending reboot. Following are the list of applicable states you get with client pending reboot. Create a device collection ,choose query based and paste the following WQL Code into it. we have just created a collection to know the list of devices with pending reboot. You can now decide if you can reboot them using client notification or not. How to reboot all devices at once ? you cannot do it by right click on collection , you must go into the collection ,choose all devices ,right click and do client notification . Collection level do not have reboot option. Now we will look at SSRS report. With the information that is available in SCCM ,we can have variety of reports however ,i am going with following customisations. 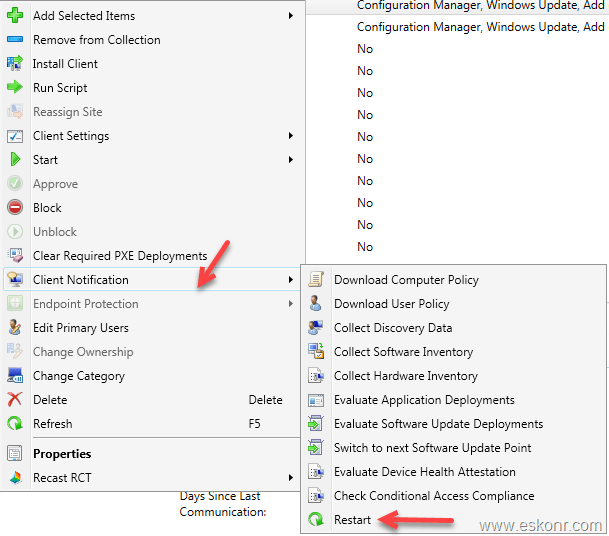 A report with custom collection and device restart type (Configuration Manager ,Add or Remove Feature etc ,multiple) . It will show you count of Pending restart devices by Operating System. The count will have drill down report to show list of clients with inventory information like last hardware inventory, IP address, last MP ,software update scan etc. Click on Pending Restart count appear in Blue colour to see list of all clients of that particular OS. Child report has 3 parameters: Collection name ,Restart state name and OS .All these parameters will be passed to child report from parent report. 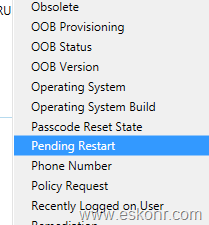 You might see pending reboot for clients that are inactive and this because , client never reported back to SCCM after pending restart status message and it will remain same until the device comes online and report its status. You must run parent report to go child report. If you try to run child report directly ,you will run into issues which is expected and is because of hidden parameters in child report. How to get the reports ? 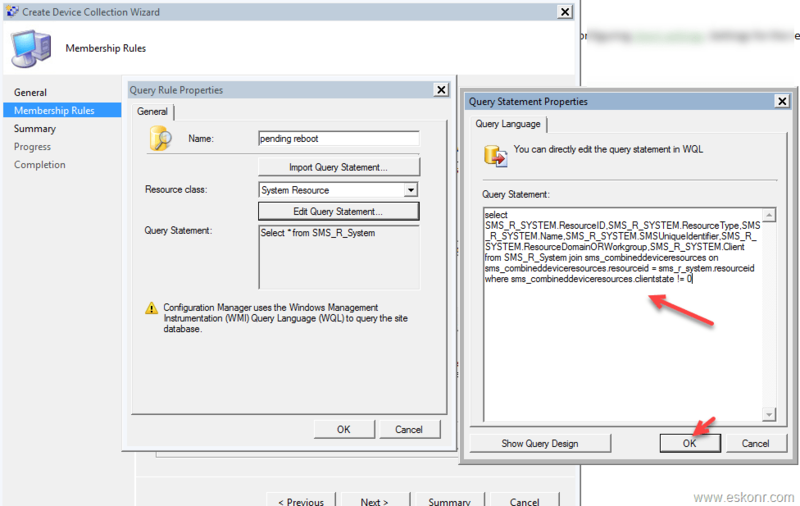 Download the RDL files from Technet Gallery ,extract it ,upload the files to your SSRS reports (make sure both the reports in same folder location) ,change the datasource and run the reports. 2 Responses to "SCCM Report Get list of devices with pending reboot in a collection with different states"
Got this error: The 'CollectionID' parameter is missing a value, when running the report "List of clients with Restart Pending". The other report "Count of Clients Restart Pending by OS" is working just fine. Both reports are on the same folder. Please edit the 2nd report and change the collectionID prompt value to show from hide .That will tell you whether the value of collection ID is passsing as parameter to linked report or not. I tried it and it works fine for me.